First off, I would like to thank the hair salon one block over from my favorite Orange County shabu shabu restaurant for having a building, not to mention landscaping, that perfectly matched my outfit today! I was seriously not expecting that, I swear! However, I love it when an outfit and a background come together in perfect harmony! Second, my inspiration from this skirt came from the Instagram account LIKEtoKNOW.it. Somehow I ended up subscribing to it and it has been addictive ever since. If you don't already know about it, the account features bloggers, but they deviously don't tell you any of the details of the outfits featured unless you "Like" the photo. "Liking" the photo then sends an email "straight to your inbox" with all the relevant details of where each piece of the blogger's outfit can be found. I occasionally see things I like, such as this skirt, which I thought was going to be much more expensive than it was. It turns out that it was from Forever 21 and that meant it was cheap, cheap, cheap, which is always a plus. Also, the scuba-like fabric of the skirt was perfect for shabu shabu today, because you can easily just wipe up anything that splashes or spills. All in all it was a win, win situation! Bag: Louis Vuitton Marly bb in "Pistache"
Another wonderful skirt Katie :) And all the better that it was an unexpected steal. Those often turn out to become my favorite pieces. Also love the fresh color of the bag. What a fun, fun skirt and bag. Your white top and necklace are so pretty and classy, too. And the metallic pumps are just stunning. I cannot believe such a gorgeous skirt is from F21. It looks like from your usual - J.Crew. Oh my goodness! I LOVE this outfit. You look gorgeous. What a great find at Forever 21! I shop online often - amazing prices. The bright neon bag is perfect! 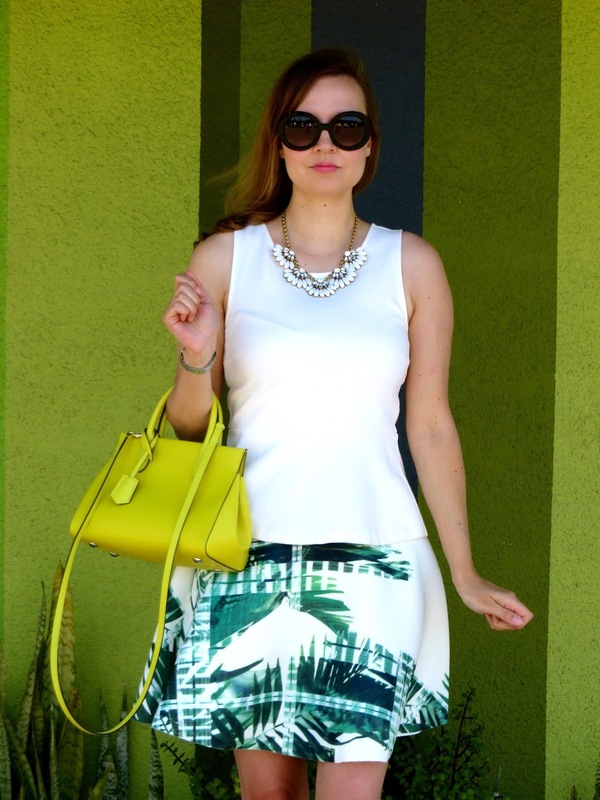 That skirt is fabulous and I love your white peplum top! That skirt is so pretty and I love your gold shiny heels! I have seen other bloggers with the Like to Know It and I haven't had a chance to sign up yet... I need to, so I can find out what they are all wearing! OMG I'm crazy about that skirt! LOVE this palm printed skirt! 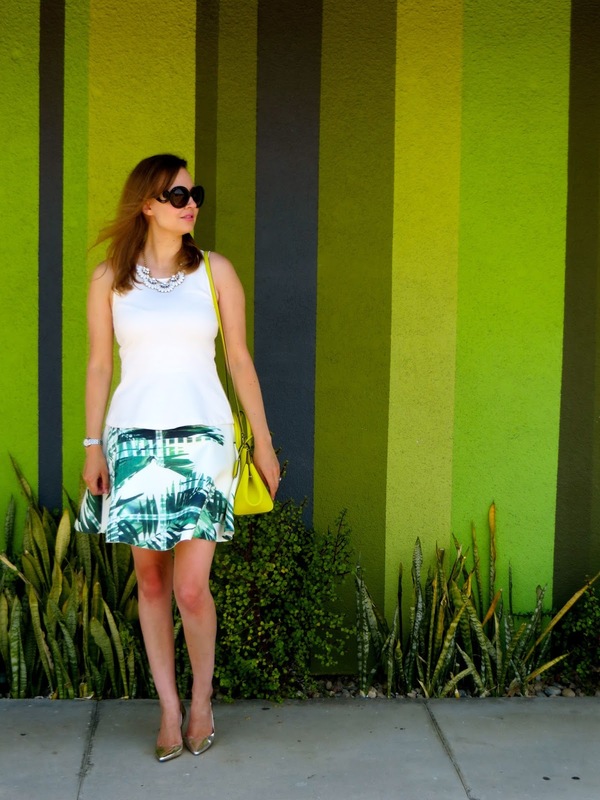 That is the perfect backdrop and the perfect summer look too! Beautiful, Katie! Thanks for sharing with Fun Fashion Friday! Great skirt and I agree that liketoknowit usually feature some more expensive items from bloggers so it's a treat when it's very reasonably priced. Where is this Shabu Shabu place, we are always looking for yummy places to eat in OC.